David was born in 1960 in Newport, Wales. 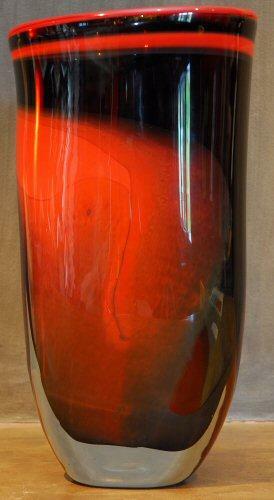 In 1977 he commenced working with glass under tuition of Michael Harris on the Isle of Wright. 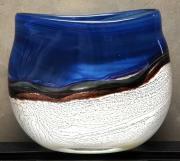 He learnt about the aspects of design and methods of creating glass objects. He spent the next 7 years mainly working for Harris, but also for various smaller glass studios and with other glass artists in England and Europe to gain more experience. In 1984, David visited South Africa on holiday and decided to make it his home. During 1987, he returned to Europe and spent most of the year working in Scandinavia where he had the opportunity of learning from Sweden's top glassblowers and artists like Kristin Munter and Wilke Adolfson. David makes his own glass using an English recipe. The colours are imported from Germany in the shape of rods. He uses free-blowing and casting techniques for the creation of unique sculptures and functional art glass. He applies colour during the final stage of the production process using various techniques such as fusing, where two coloured rods are separately heated and then joined together. Working with architects and art galleries around the world, David's designs are clean and classical and have a simplicity of colour and form. His glass sculptures are inspired by the mountainous environment he lives in, the seas around the Cape coast, and the desserts of Namibia. David's work can be found in various private and corporate collections including the South African Cultural History Museum, Durban Art Museum, Pretoria Art Museum, Pietersburg Art Gallery, Gilbey's Collection (South Africa), and Broadfield House Glass Museum (England).